Tue, February 19, 2019 7:30 P.M. 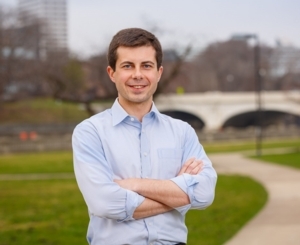 The multifaceted, 36-year-old progressive mayor of South Bend, Indiana, Pete Buttigieg is a Rhodes Scholar and Harvard graduate. Nearly a decade ago he left a successful career in business to return to his “dying” hometown with a dream of reinvention. During his two terms in office, he has transformed South Bend into a model of urban renewal, served a military tour in Afghanistan, and after coming out as a gay man, has found acceptance, love, and marriage. Once described by The Washington Post as “the most interesting mayor you’ve never heard of,” Buttigieg changes all that with this frank, inspiring memoir.